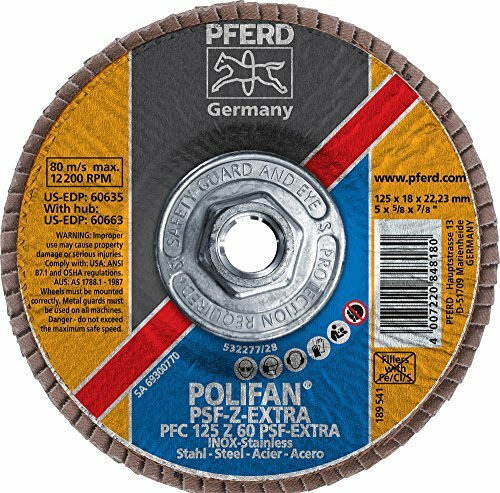 PFERD Polifan PSF Zirkon-Extra range of flap disc features a special flap arrangement to provide flexibility and a cushioned grinding effect. Built with premium Zirconia abrasive material, PSF Zirkon-Extra is constructed with 40 percent more material than standard PSF flap discs, providing a long service life and an improved surface finish. Ergonomically optimized products and power tools that contribute to greater safety and working comfort, and thus to health protection. Comfortable working with reduced vibration and lower noise and with perfect results in the shortest possible time. Specification: Diameter (inches): 5; 5/8-11 Thread; Grit: 60; Maximum Rotational Speed (RPM): 12200; Style: Type 29.